After a long and busy summer, chances are, your home has become a little chaotic. With the kids headed back to school soon, now is the perfect time for a little organizing. Here are some easy ways to organize your home and bring back the peace. > If the cupboards and drawers in your kitchen are becoming difficult to close, it’s time to clean them out. Chances are, those areas stuffed to capacity may not be as well organized as they could be. Take everything out and organize them by group (what this means depends on what makes the most sense to you). Whatever you don’t need anymore, either throw it out or donate. > If you’re sick of knocking things over in the fridge every time you reach in for the milk, a rotating tray may be the answer. Simply place inside your fridge and put the things you use the most on the outside. Then, when you need it, simply rotate it towards you. > Nothing can make a kitchen seem more crowded than accidentally buying duplicates of things you already have. Keep a grocery list on a pad of paper or on your phone and update it frequently as you run out of specific items. > Even if you have a small kitchen, you can still maximize the space available to you. 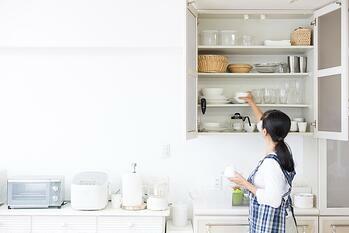 Use hooks and shelves to store items, such as pans, instead of taking up counter space. You could also try a ‘rolling island’ that can be brought out when you need extra prep room and then put away when you’re finished. > A closet organizer can make even the smallest of closets seem roomy. These are fairly inexpensive to purchase and easy to install. If changing the closet isn’t possible, hang all of your longer clothing on one side of the closet. This will give you room beneath your shorter clothing to store items such as shoes. > Utilize the space beneath your bed. This can be a great place to store shoes, off season clothing, and more. If your bed is too low to the ground, try some bed risers. Once you’re finished, a bed skirt will easily hide your secret stash. > You probably have a lot of ‘stuff’ in your bathroom. Drawer organizers are a great way to combat this. You can also use a plastic tote to store things like hair products, make-up, etc. that can be easily stored when you’re finished getting ready. > Clean out your cupboards frequently and get rid of items you don’t use or are expired. > Use the space above your toilet for storage. There are shelves that are specifically designed for this that can help you store extra toilet paper, towels, and more. > Keep the collectibles to a minimum. They can easily take over a room. > There may be opportunities for more storage space that you aren’t utilizing. For example, a coffee table that doubles as a storage chest or the area behind the couch can be used to store blankets. > Use the wall to display your favorite photos instead of frames on every surface. Command strips are a great alternative to walls if you’re renting or just aren’t ready to make the commitment of putting holes in the wall. > The number one thing you need when it comes to cleaning out the garage is time. Schedule time specifically for cleaning out and organizing the garage. While cleaning, separate everything into either keep, sell, donate, and trash. > Once you’ve narrowed everything down to what you will be keeping, start organizing. This way, you’ll know exactly what you’ll need to purchase. This will prevent you from buying something, such as container that's not the right size, that’s not going to work. > Make sure you label everything. That way, you won’t have to pull down and open every box just to find the Christmas decorations every year.